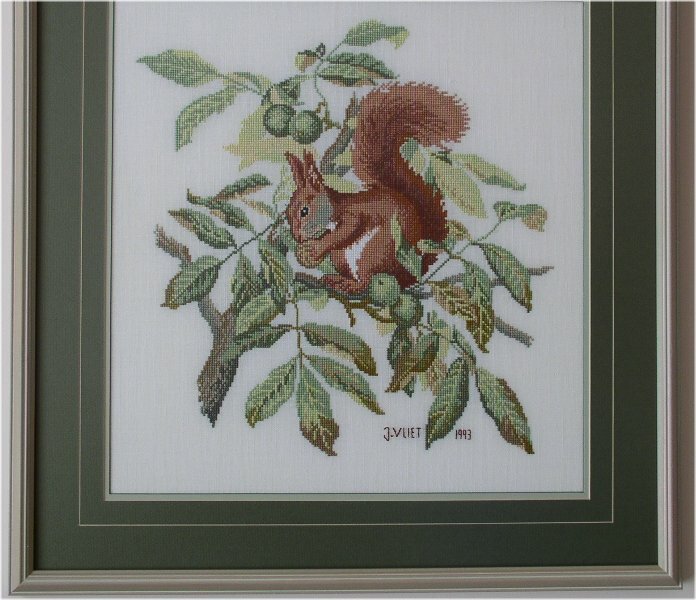 Jeannette's neeldepoint hobby takes place throughout the whole year, i.e. 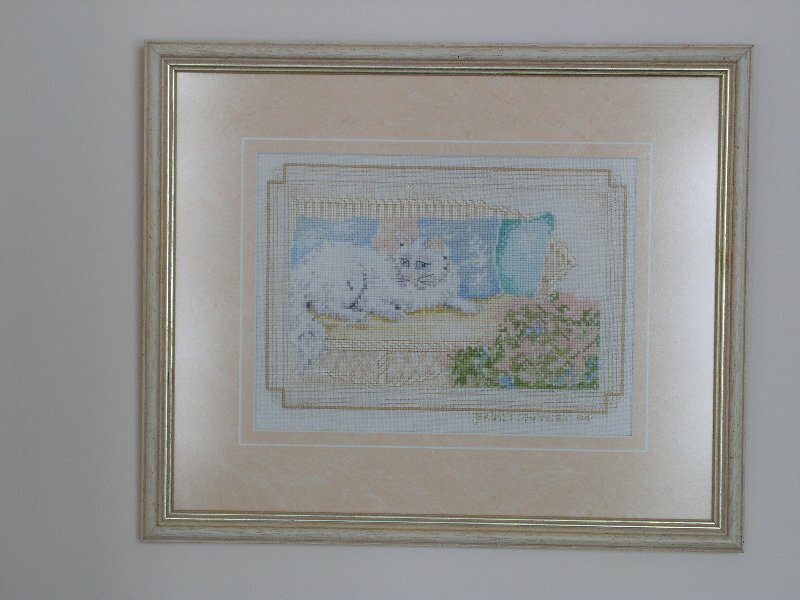 on a lounger in the warm sun or on her recliner in front of the fireplace. 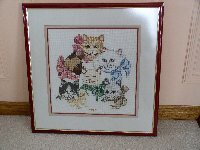 She does it one cross-stitch at a time, but hundreds of hours later beautiful pieces are the results. 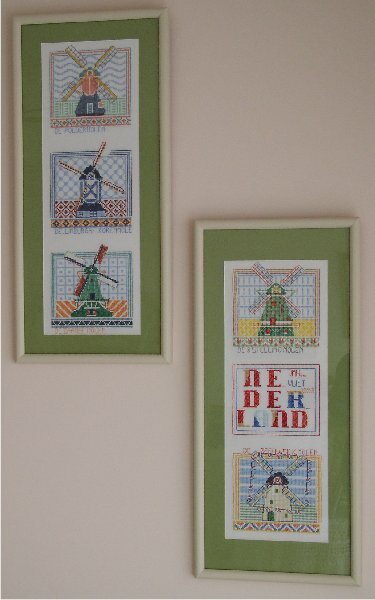 Most of her works are "counted cross-stitch", i.e. 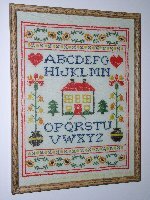 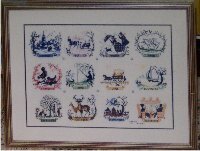 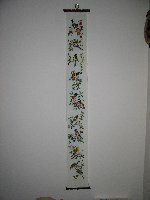 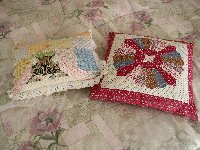 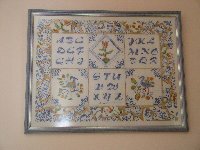 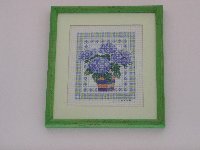 the pattern is printed on paper with a specific symbol for each colour and she has to make the cross stitches on a clean canvas. 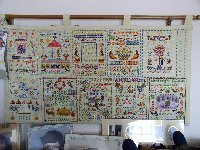 She first has to find the center off the canvas and then start counting from that reference point. 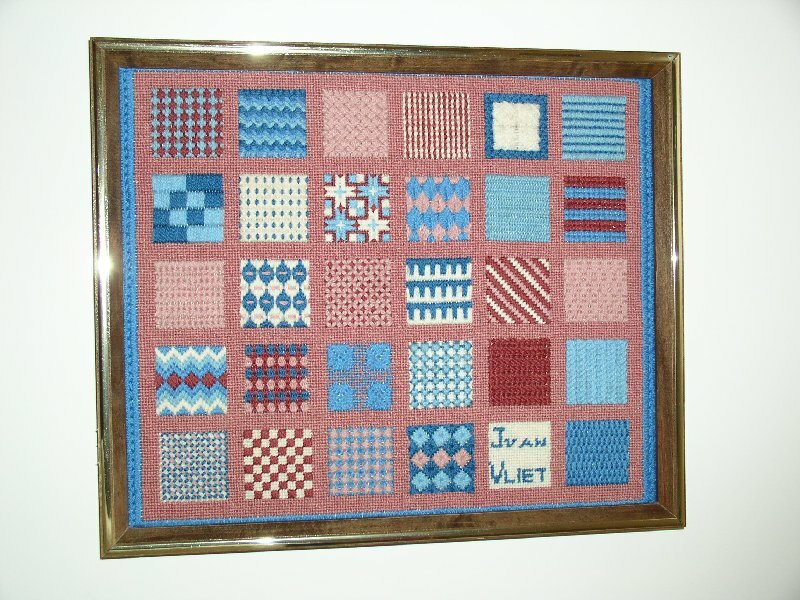 It would drive Pieter absolutely nuts (which he is already according to others), but Jeannette finds it relaxing. 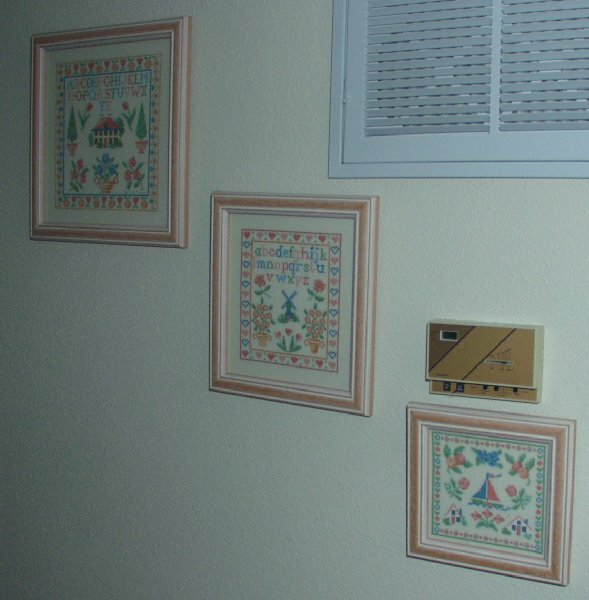 Here are some examples of her handy work. 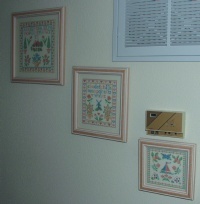 All sizes are expressed in width X height. 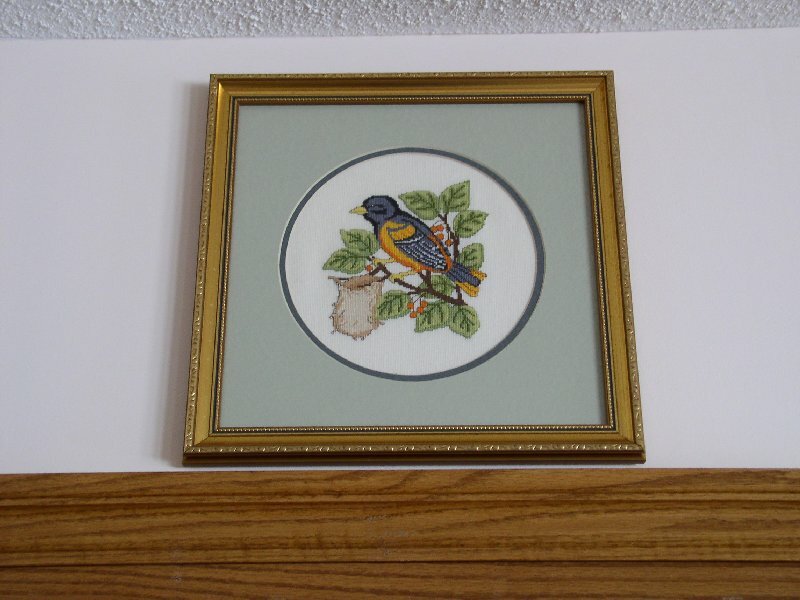 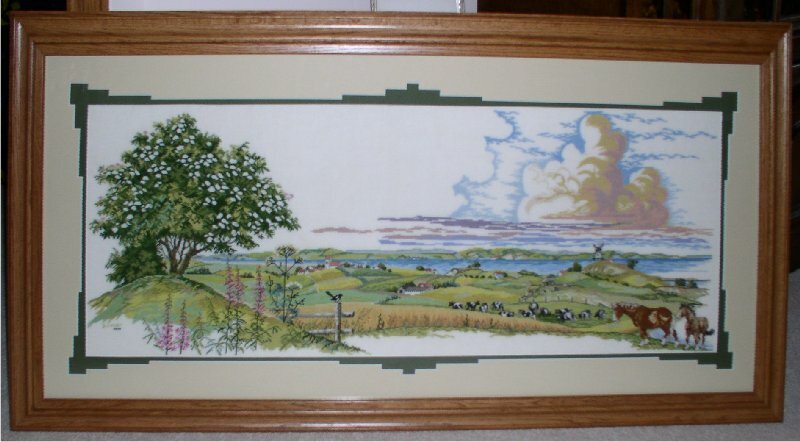 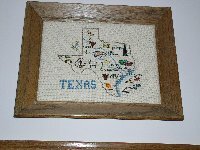 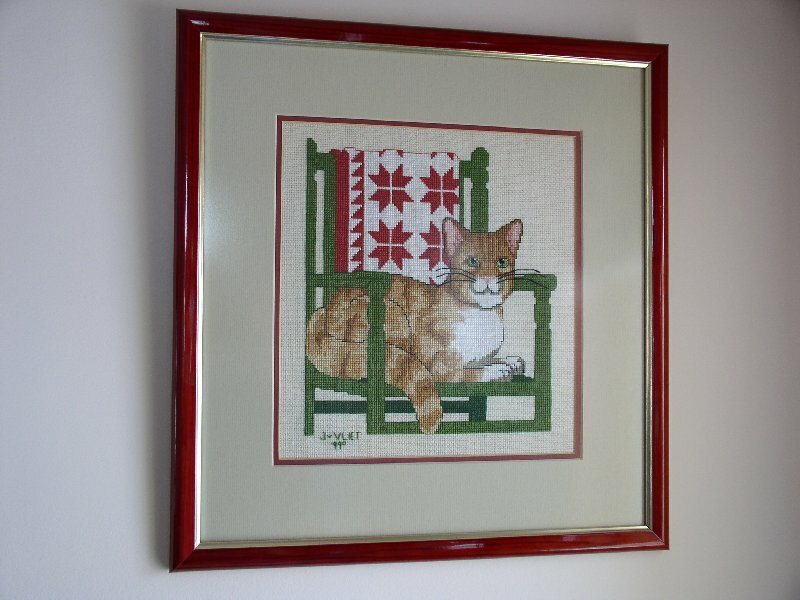 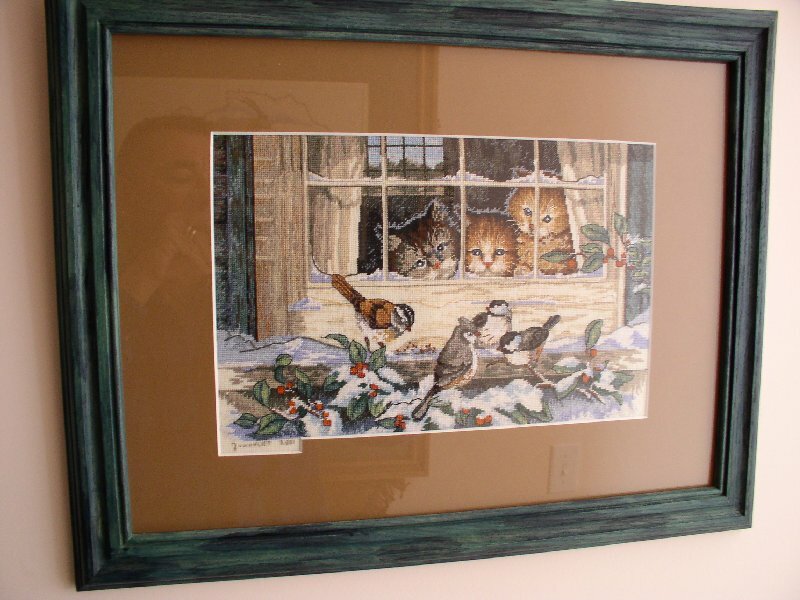 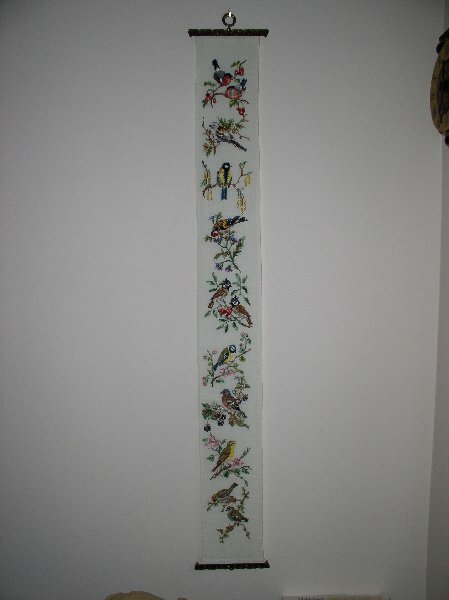 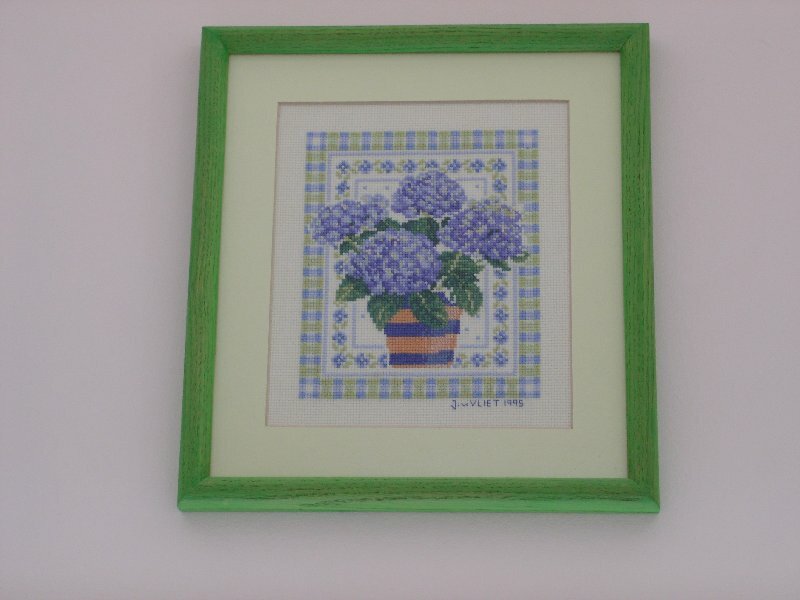 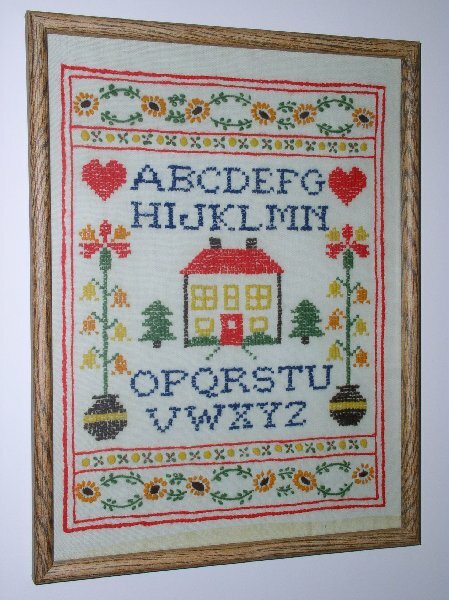 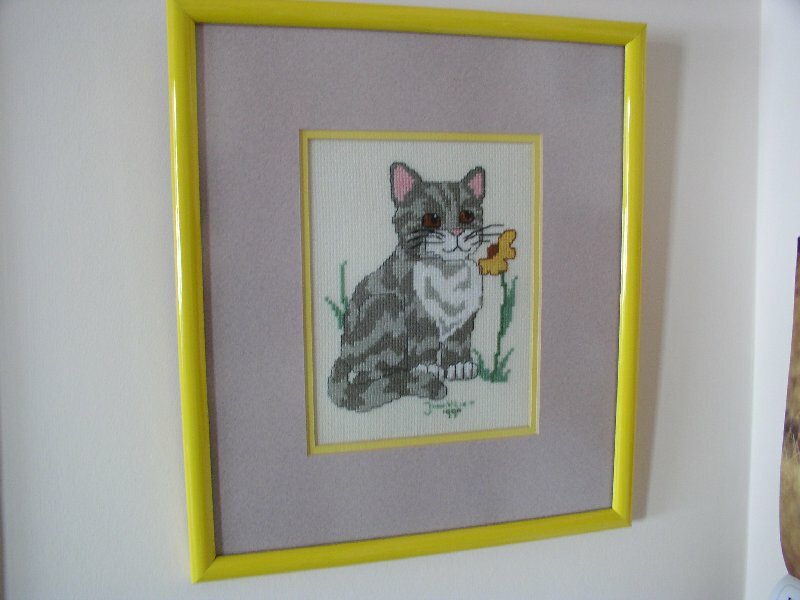 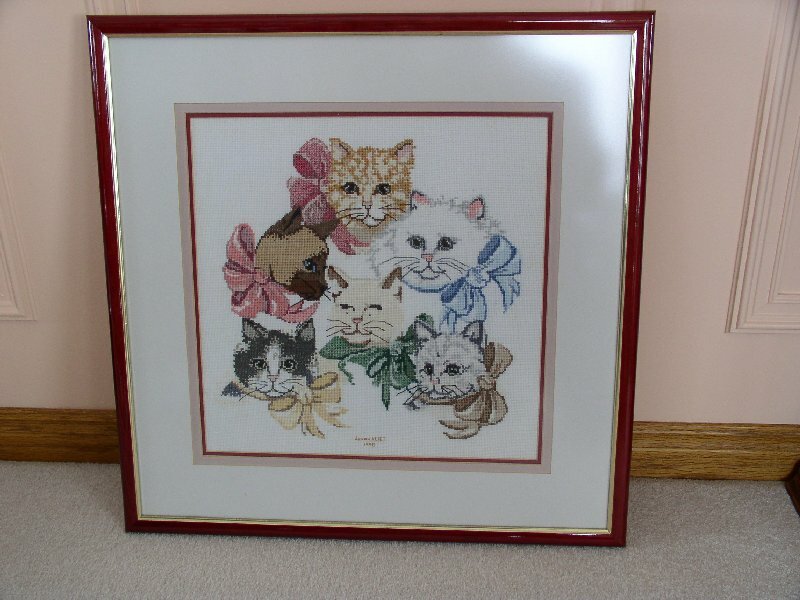 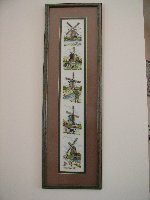 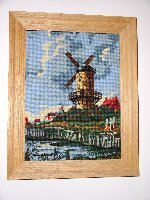 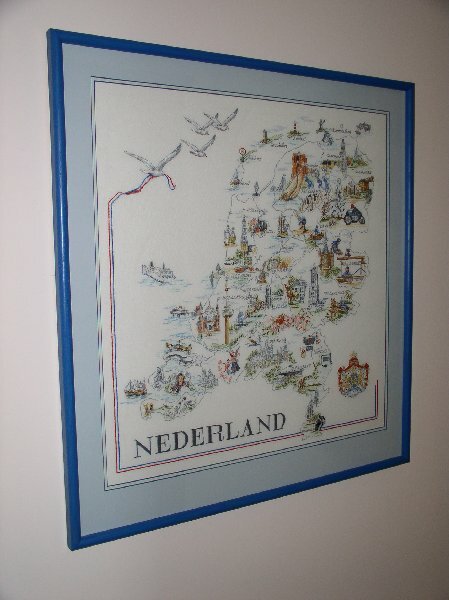 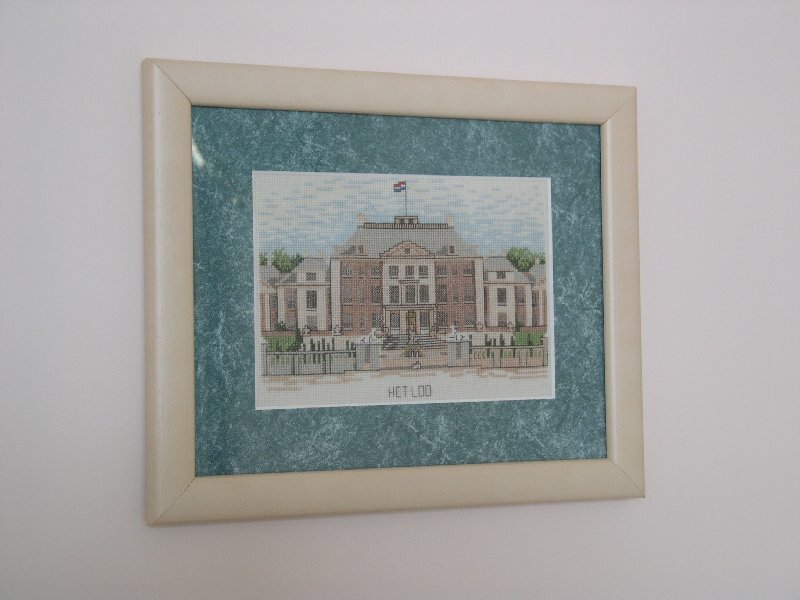 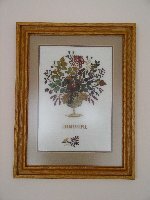 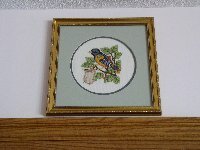 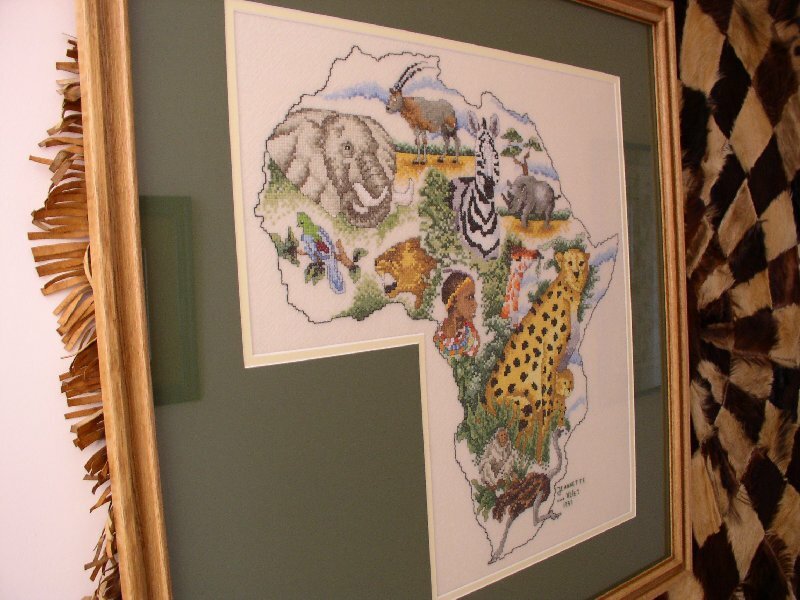 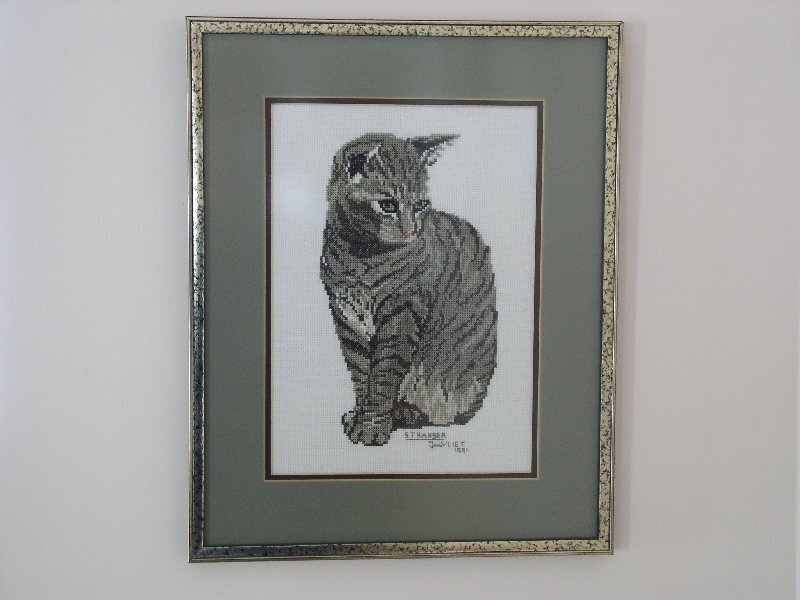 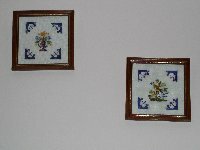 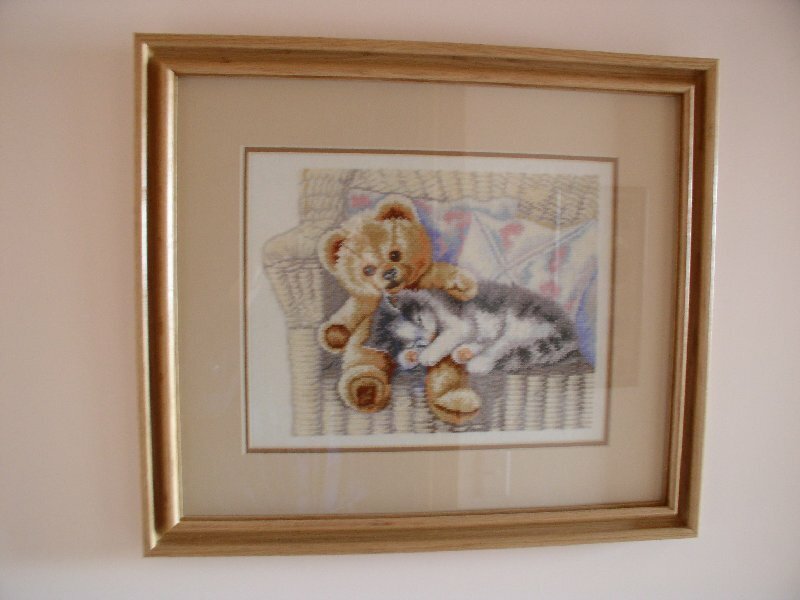 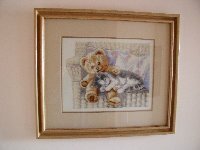 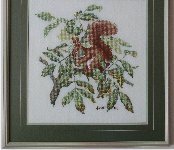 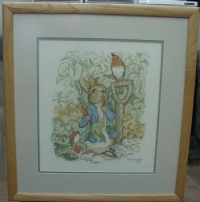 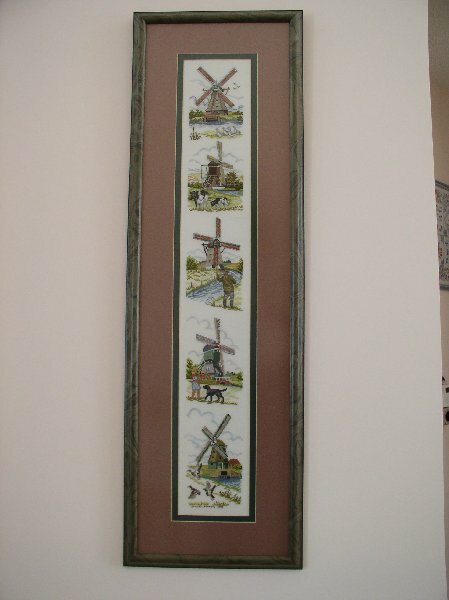 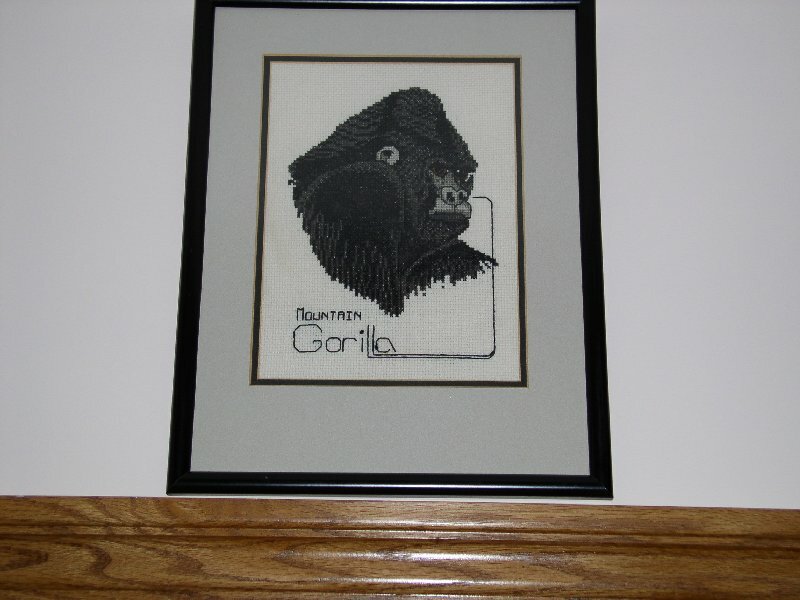 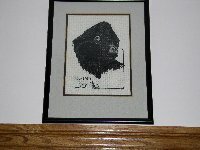 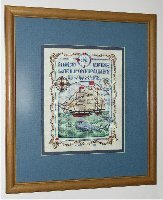 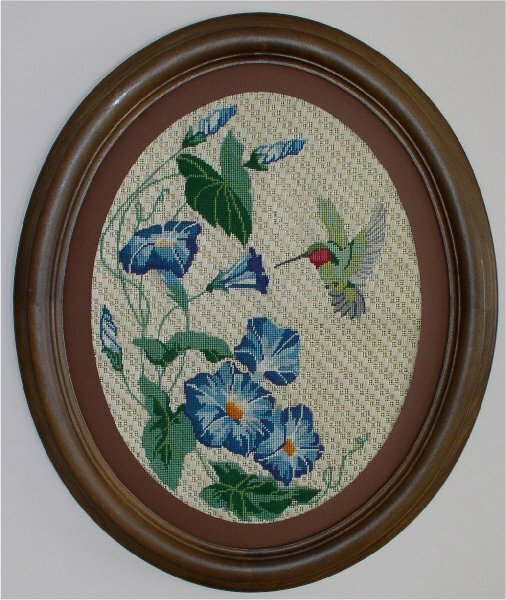 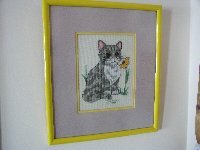 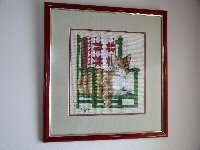 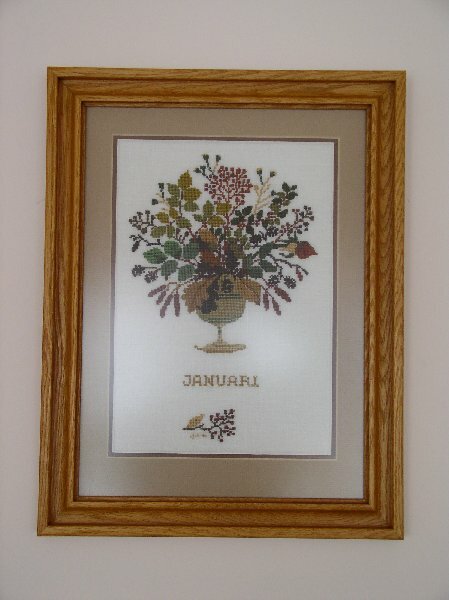 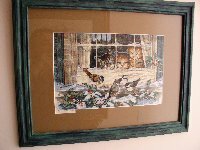 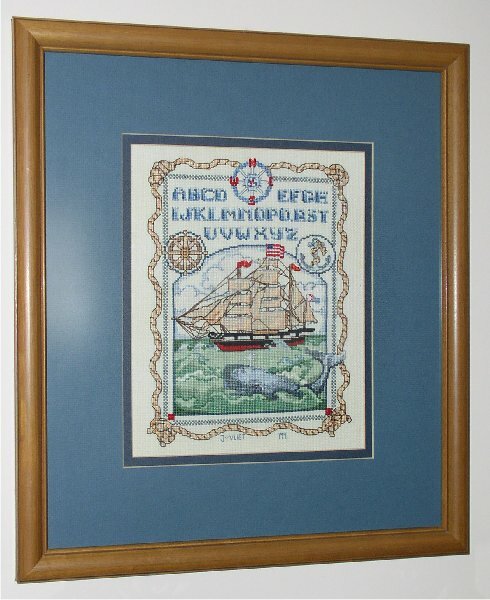 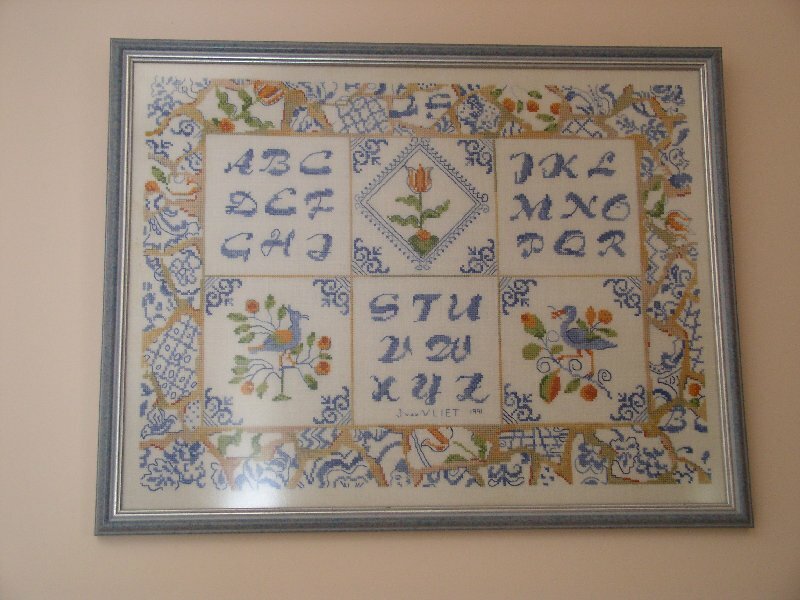 Making pictures of framed needlepoint works is a challenge to say the least. 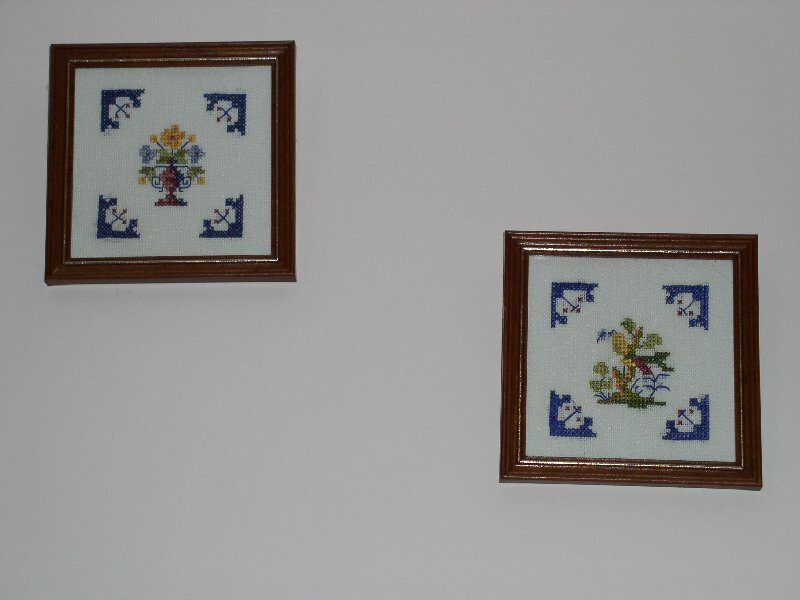 The "pixels" of the cross-stitches and the pixels of the digital camera can create strange superimposed patterns. 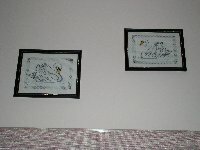 Then there is glare and reflections. 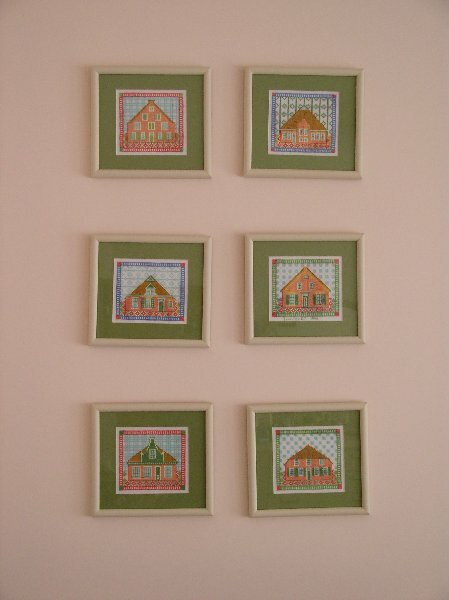 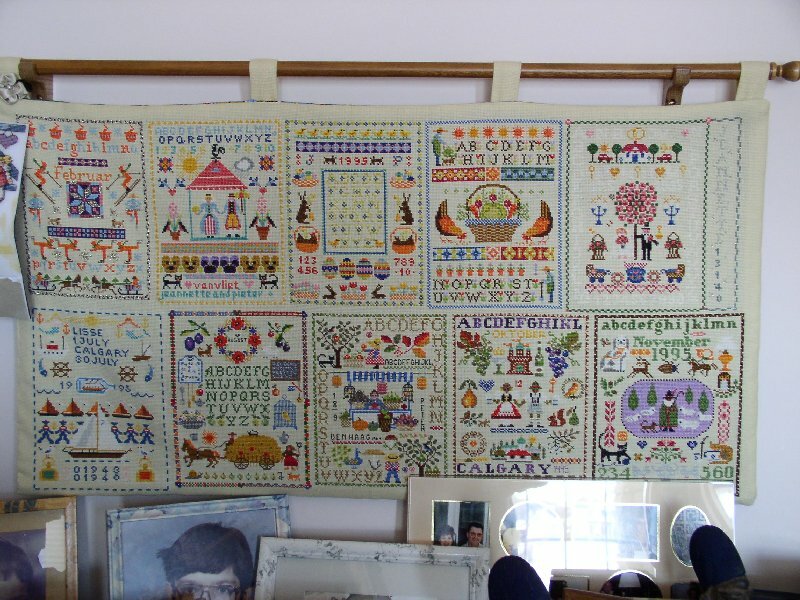 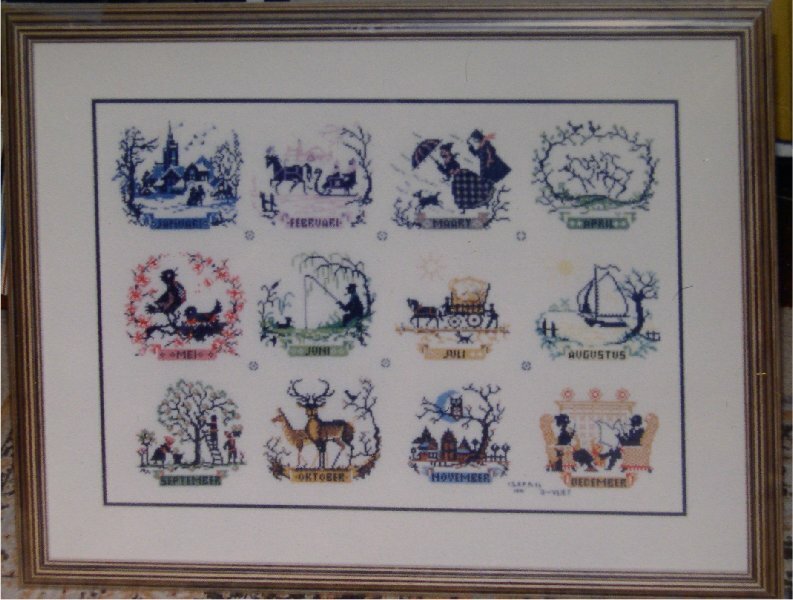 Blame it on me if Jeannette's needlepoint works don't look perfect, because in reality they are perfect. 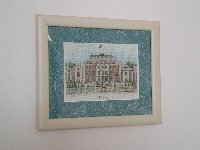 Our house Pieter to take a digital picture of our house and translate it into a counted cross-stitch pattern. 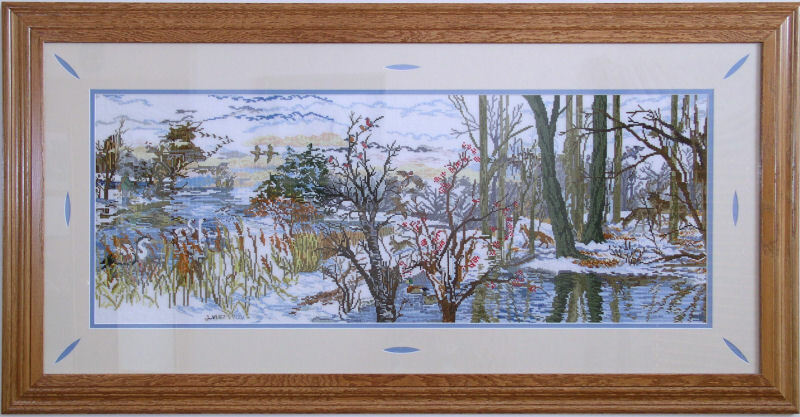 Winter in Denmark (Aug-2002 to Dec-2008, 118cm x 45cm) Eva Rosenstand kit 12-793. 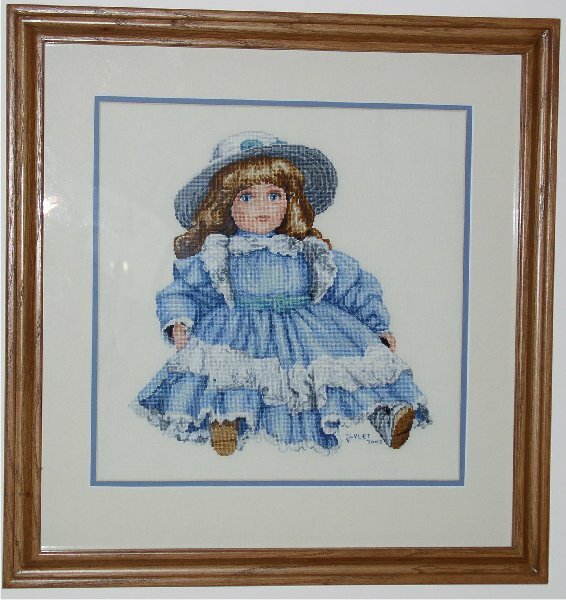 Doll in blue dress (started Nov-2001, finished Sep-2002, 32cm x 42cm) Verachtert (Belgium) kit 45.601. 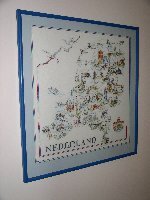 Framed by Pieter. 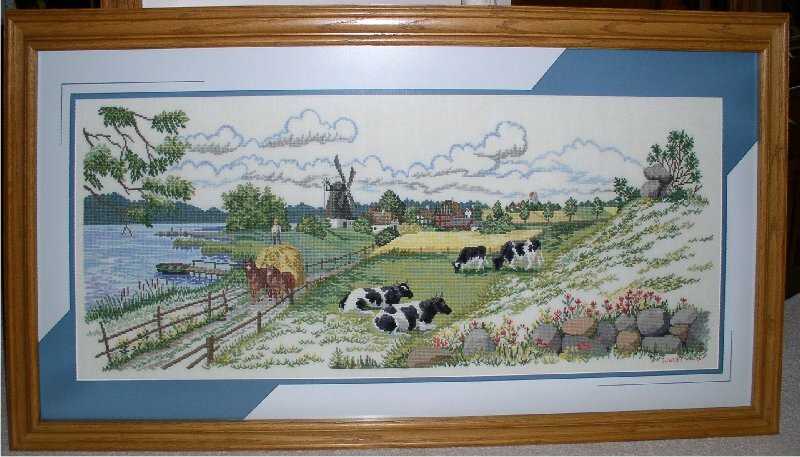 Spring in Denmark (started Sep-2001, completed May-2002, 118cm x 45cm) Eva Rosenstand kit 12-544. 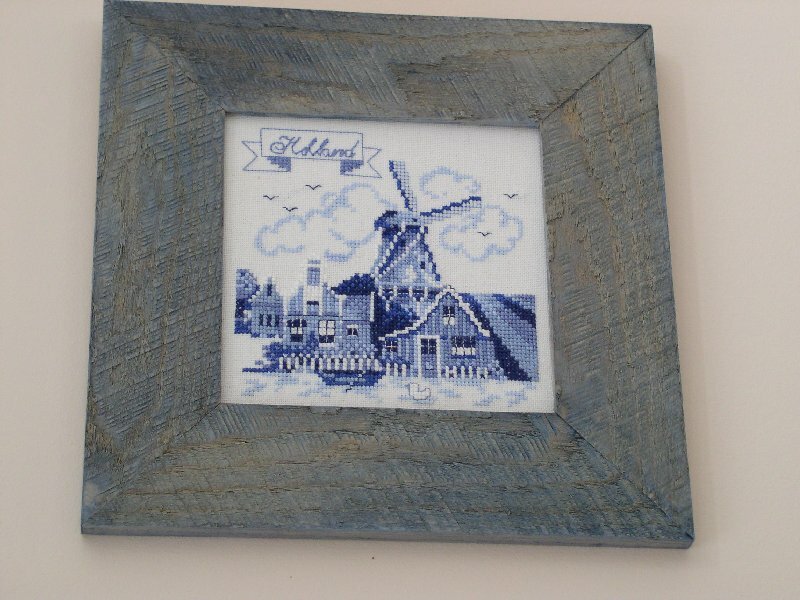 Framed by Pieter. 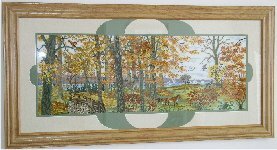 Fall in Denmark (2000, 16" x 44½", framed by Pieter 29" x 57", 468 hours) Eva Rosenstand kit 12-835. 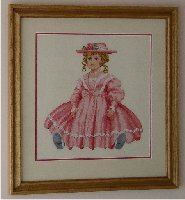 Doll in red dress (1999, 15" x 15½", framed by Pieter 22½" x 23") Verachtert (Belgium) kit 45.603. 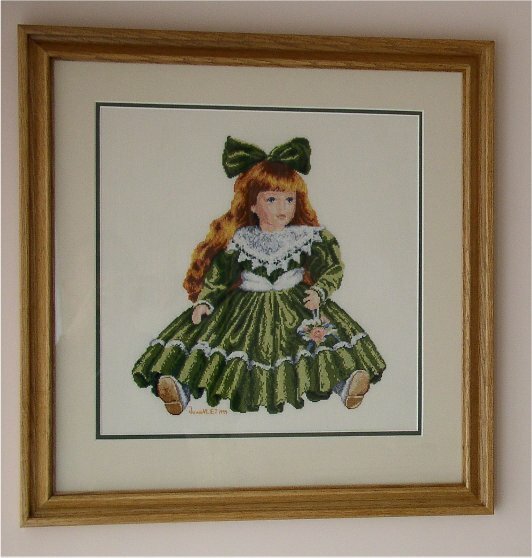 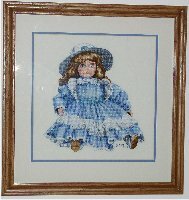 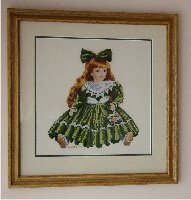 Doll in green dress (1998 & 1999, 32cm x 42cm, framed 22½" x 23") Verachtert (Belgium) kit 45.602. 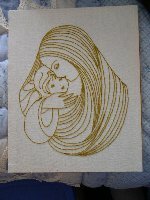 Actually made two of these. 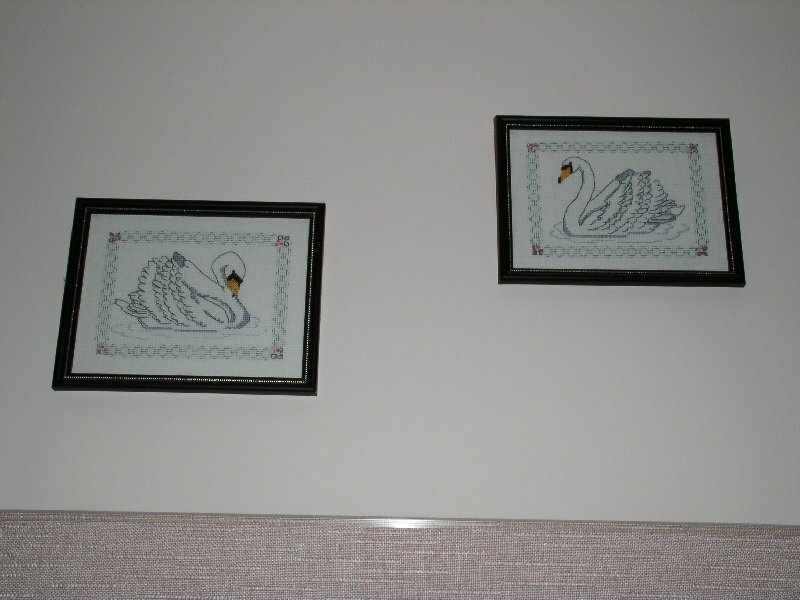 One for ourselves and one for our daughter-in-law. 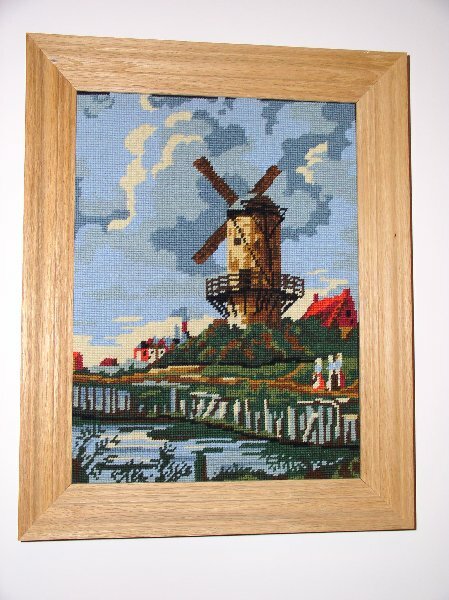 Summer in Denmark (1996, 45½" x 18½", framed by Pieter 56½" x 29½", 464 hours) Eva Rosenstand kit 12-724. 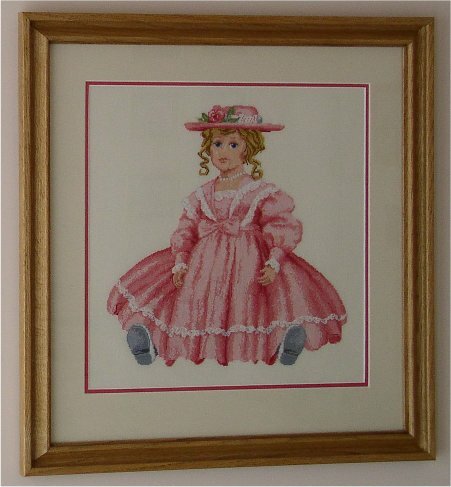 Stranger head (1993, 6" x 8", framed 10½" x 12½") Eva Rosenstand kit 12-714. 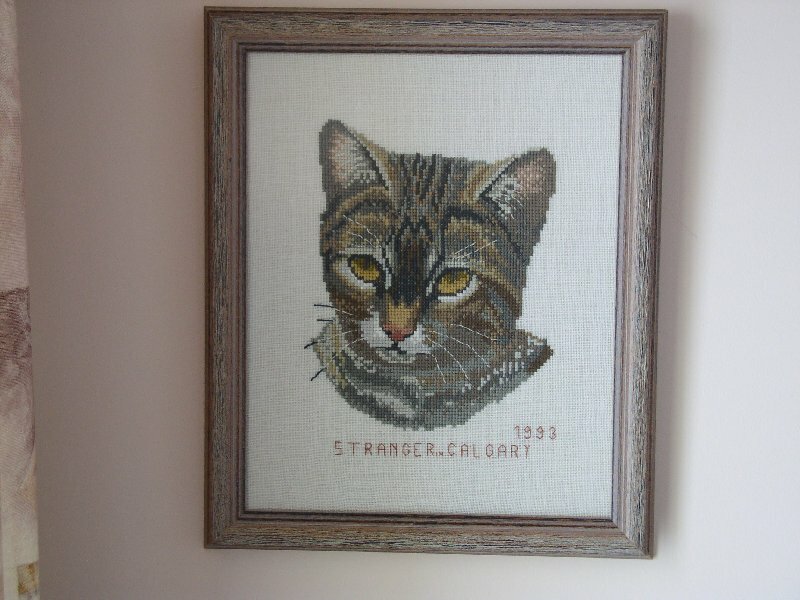 "Stranger" was the name of our cat who came to us as a stray in Houston in 1982. 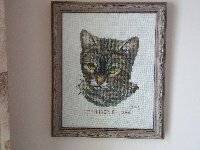 She adopted us, and have travel with us to The Netherlands, South Africa and Canada where she died in 1996. 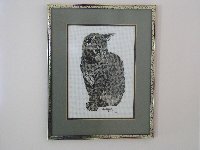 Made in the warm sun next to our swimming pool in Durban, South Africa. 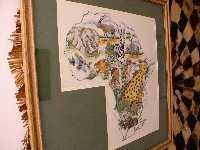 Another work complete in between basking in the sun and cool swims in our pool in South Africa. 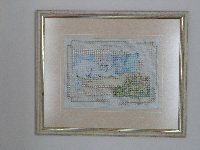 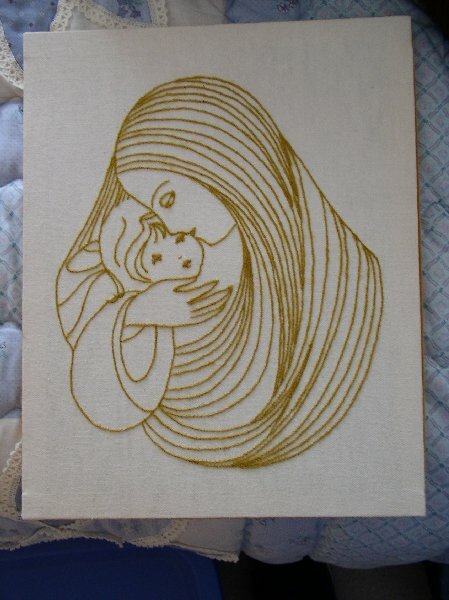 Twelve Months 1 (1990) Made for 25th wedding anniversary of Jeannette's sister Yvonne. 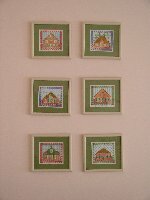 Christmas Stockings -- set of 4 (2000/2001) Made for a friend. 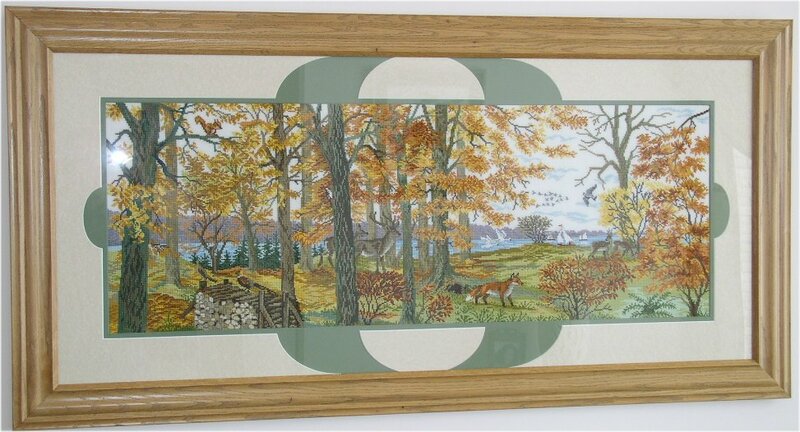 Farm Courtyard (1994, 50 cm x 65 cm) Eva Rosenstand kit 12-710. Made as wedding gift for Jeannette's niece Jolanda. 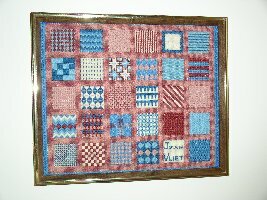 Twelve Months 2 (1991) Made for 25th wedding anniversary of Jeannette's sister Leny. 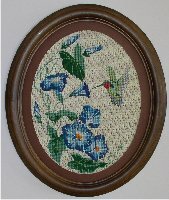 At least 20 other works. 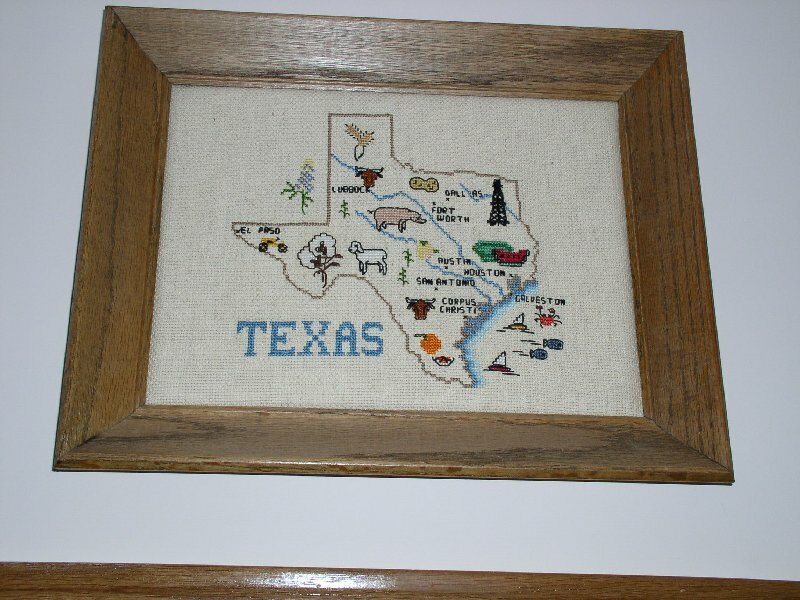 Hanging in the homes of relatives and friends.